I'm updating my pipeline for exome sequencing analysis, so I'm experiencing the HaplotypeCaller capabilities! I have analyzed the same sample with the UnifiedGenotyper walker and the HC one and I have examined the differences between the two output vcf files and I had a very bad finding... HC failed to find a true novel variant!! I know that this is a true variants because I validated that with Sanger sequencing after the first calling with UG. I have run HC using GATK version 2.7-4-g6f46d11 both in a single- and in a multi-sample manner but not the shadow of this variant in the VCF output.. Thanks Flavia, we'll try to have a look at this asap. I'll let you know when we have a better idea of what's going on. I've just uploaded my data in the FTP server in a file named flapa_data.tar.gz; I created a BAM file for the whole chr7 in which the non-called variants fall. I hope this can be helpful! I was able to reproduce your issue, so I'm now passing this on to the devs for in-depth debugging. I've taken a look at your example and would like to explain what's happening. If you look carefully at the HC call in that region you'll notice that it assembles it into a very large (120bp) deletion (with 90% of your reads supporting that call). The HC believes that those "SNPs" aren't real, but rather are artifacts from a misalignment around the deletion. I've attached a screenshot of your data that illustrates it quite nicely. The upper half shows the nice clean HC re-alignments around the deletion. 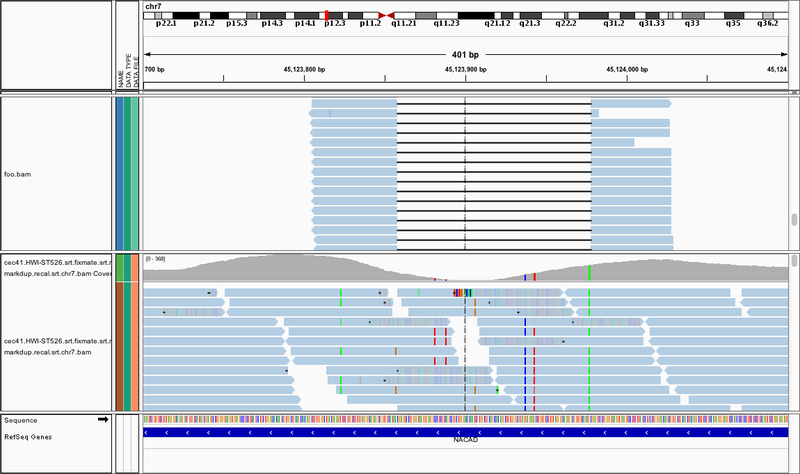 The lower half shows the original reads; notice that the coverage drops dramatically over the deletion and that those "SNPs" occur near the breakpoints. These are classic signs of mis-alignments. Is it possible that the Sanger sequencing validation could be interpreted in this way too? thank you so much for your very clear answer. The gene sequence is very repetitive; so, after your explanation, I think that also the Sanger sequencing could be interpreted in this way. Now I'm trying to perform a more specific PCR and I'll let you know if I'll reply the validation.